Marlon Samuels scores his third test hundred. When the West Indies chose to bat first and slumped to 63-4 before lunch, it seemed to be the same old story for England, who must have been eyeing a bat before the end of the day. However, Marlon Samuels stuck with the inevitably adhesive Shiv Chanderpaul and the pair put on 82, but Chanderpaul and Denesh Ramdin fell in quick succession, leaving the Windies tottering again on 136-6. Enter their much-maligned captain, Darren Sammy. Constantly criticized for his lack of runs and wickets, he put all the doubts to bed. 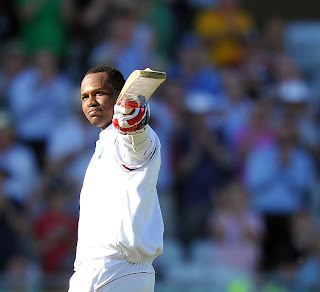 Samuels also flourished as runs were being racked up at a one-day rate. England's bowlers lost all semblance of control, though it has to be said that they were rather unfortunate at times; the ball constantly flying in the air through gaps. The two batsmen put on the highest seventh-wicket partnership in Tests at Trent Bridge and their stand was worth 168 at the close of play (150 coming in the final session in just 33 overs), West Indies having reached complete safety at 304-6. Samuels' 107* is just his third Test century in the 12 years since his debut while Sammy's 88* is by far his highest Test score. On a pitch which noticeably flattened out throughout the course of the day, England could be facing a hard task to wrap up the innings tomorrow.